Rachel Roe is a Norwegian in training. 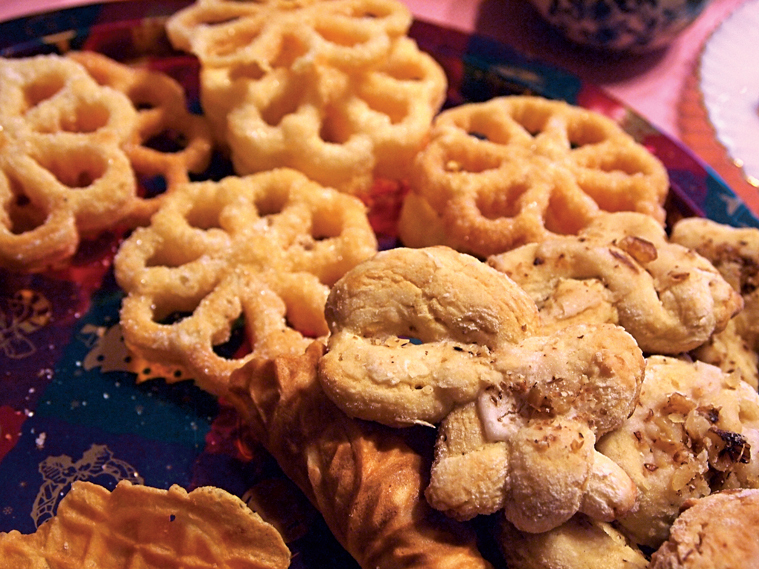 Growing up in Cincinnati, Roe never had krumkake, rosettes, kringla and other holiday treats beloved by South Dakota’s Scandinavians. After she moved to Brookings in 2004, her husband Jay’s family brought her up to speed. “The rosettes and the krumkake, I loved right off the bat. Krumkake reminds me a lot of Italian pizzelles, which I’ve had before. I had not ever heard of the rosettes, but was impressed by how flaky and delicate they are,” Roe says. She hopes to someday teach her young son, Lex, about the food traditions from both sides of his family. To achieve that goal, Roe, who also writes a blog called Trampling Rose, is learning to make rosettes from her mother-in-law, Mary. “They are as fussy as I imagined,” Roe says. It’s not easy to master heating the rosette iron, dipping it in the thin batter and prying off the fragile cooked rosette with a fork, but the fuss is worth it. “You can’t go wrong with fried batter covered in sugar,” she says. Combine all ingredients and blend until smooth. Pour batter into a bread pan or other high-sided dish. Pour 3 inches of vegetable oil in a Dutch oven or electric wok and heat to 350-400 degrees. Place rosette iron in to heat. Remove iron when thoroughly heated, letting extra oil drain before dipping it into the batter. (The batter should sizzle and bubble.) Do not let batter cover the top of the iron. Place batter-covered iron back into the oil and cook until the rosette is crisp and golden brown. Remove rosette from iron and drain on newsprint or paper towels. Roll cooled rosettes in vanilla sugar before serving. Editor's Note: This is revised from a larger feature on holiday food traditions that appeared in the November/December 2013 issue of South Dakota Magazine. To order a copy or to subscribe, call (800) 456-5117.